Biding your time in Bogota? With Vonage, you can stay connected with those you love in the U.S. With the Vonage World® plan, we’re keeping it easy to understand how to call the U.S. from Colombia. You can now use Vonage to reliably and affordably call the U.S. from Colombia. Explore how to call from Colombia from the U.S.
To call the U.S. from Colombia, choose the Vonage World® plan. Vonage Boxes™, shipped via UPS to Colombia, are easy to set up, portable, and support two solid Vonage connections. 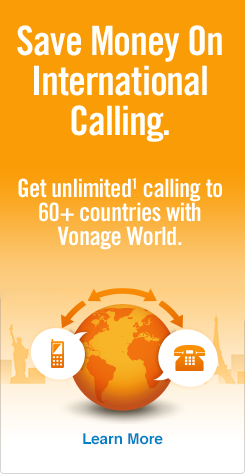 The Vonage World® Plan includes 60 countries, guaranteeing you won’t lose touch with those you care about. So you can call the USA from Colombia and stay so well connected it’ll feel like you never left. Communicate to landlines and mobiles — unlimited¹ calls from Colombia to the USA! Vonage-strong call quality for consistently clear communication. Domestic calls — ship a Vonage Box with a U.S. number to Colombia. All U.S. numbers calling that box are making local calls, as those are U.S.-to-U.S. calls! With Vonage, you’ll never be surprised by high fees and rates, so you stay connected with loved ones for less. Choose Vonage and the Vonage World plan to stay connected with family when you want to call the USA from Colombia. Trust Vonage to keep you connected with strong call quality and great rates.